Church leaders oppose intervention as British Govt motion on military action defeated. 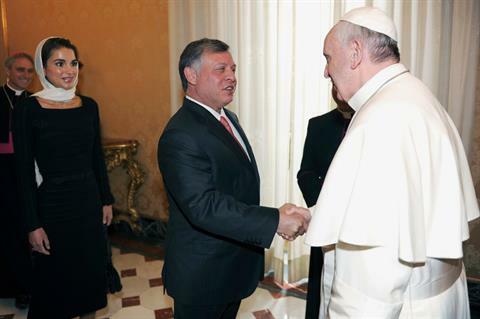 Pope Francis and King Abdullah II of Jordan have said dialogue and negotiation are the “only option” for putting an end to the conflict and violence in Syria. The statement was made ahead of the defeat of a British Government motion to authorise military action in Syria if it was supported by evidence from UN weapons inspectors investigating claims that the Assad regime had used chemical weapons against civilians. The coalition government under David Cameron was defeated by 285 votes to 272, a majority of 13. Responding to the outcome, the British Prime Minister said it was clear that Parliament, reflecting the views of the public, did not want to see military action and added that the Government would “act accordingly”. Earlier on Thursday, Pope Francis met with King Abdullah and Queen Rania before meeting the full Jordanian delegation. Afterwards, the King and some of his aides held a meeting with the Vatican Secretary of State, Cardinal Tarcisio Bertone, as well as Archbishop Dominique Mamberti, Secretary for Relations with States. The Vatican statement said that the two sides also discussed the problem of stability throughout the Middle East, Israeli-Palestinian relations and the question of the status of Jerusalem, a city sacred to Christians, Muslims and Jews. It also paid tribute to the King’s commitment to promoting inter-religious dialogue and his decision to convoke a conference in September about the challenges facing Christians in the Middle East. Other Christian Church leaders have also voiced their opposition to a military intervention in Syria, including Archbishop Maroun Lahham, patriarchal vicar for Jordan in the Latin Patriarchate of Jerusalem. “What is happening, Jordan – although it is a small country – can play an important role for peace in Syria,” he said. Separately, a statement published on the Latin Patriarch Fouad Twal’s website, pleaded with the US and its allies to be cautious and think again before taking any military action. “Why declare war when UN experts have not yet delivered the definitive findings on the chemical nature of the attack and the formal identity of its agents?” the Patriarch asked. “We witness here a logic reminiscent of the Iraq war preparation in 2003. Do not repeat the ‘comedy’ of weapons of mass destruction in Iraq when there were none,” he warned. The Melkite Patriarch strongly supported the call by Pope Francis for peaceful dialogue and an end to the civil war in Syria. He said that he had sent the Pope’s plea for peace to all the Melkite parishes in Syria. Patriarch Gregory III also voiced his concern that if Islamic militants come to power, Syria’s Christians will be under heavier pressure to leave the country. Without a Christian presence to ease conflicts between Muslims, he added, there would be no realistic hope for democracy in Syria. “If there is an armed intervention, that would mean, I believe, a world war. That risk has returned,” he said.